Industry analysts predict that during the second half of this decade, increases in software testing activity will be fuelled by software testing automation. Automated testing tools have matured and ROI to a state where ROI (return on investment) need no longer be a pipe dream. 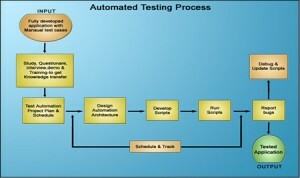 This will allow more people to be engaged in software test automation with better testing tools. Automated testing is a valuable tool that provides us with additional ways of getting to the heart of the problem. . Manually testing is a time consuming practice and is difficult to repeat. Using test automation tools to write programs that simulates thousands of executed commands in the same exact order. Each time that your software does not perform to your specifications, the program will record the exact command that caused the problem. Once you thought you fixed the problem, you could then run the very same set of commands to see if, in fact, you were successful. Automated testing can supplement the manual testing process and provide valuable insight in a speedy, objective way. Our engineers are certified in the use of sophisticated automated testing tools designed to create a repetitive and controlled testing environment. Use of these powerful testing tools means that our engineers can create automated test scripts that mimic the very same user interface over and over, thereby limiting the amount of "manual" testing necessary. However, we believe that manual testing cannot be entirely replaced by automation because the testing of some aspects of a program cannot be automated, and some should not be automated. That's why we engage several experienced people for manual testing process. Paradigm’s test engineers, who are experienced in applying automation techniques to various areas of testing, including installation testing, performance testing, functionality testing, compatibility testing. Increased transparency – Usage of test tools enables people across locations to see both the status and the result of testing instantaneously at any point of time. Significant cost benefits due to the fact that majority of test team is based at offshore. The offshore model also enables rapid ramp-up and ramp-down of resources. Access to specialized testing skills across locations. Training the resources in both manual testing and automated testing tools has enabled the client to utilize the same resources for both types of testing.